If parenting is making Americans unhappy, if it's impossible to "have it all," if people don't have the economic, social, or political structures needed to support parenting, then why do it? In Why Have Kids? Jessica Valenti asks this the controversial--but necessary--question. Through on-the-ground reporting, new scientific studies, and her own burgeoning motherhood, Valenti offers an in-depth expose into the world of having (and not having) children. 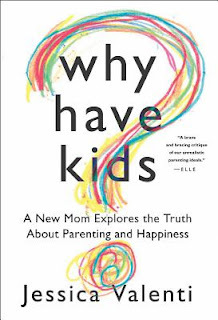 She cites shocking statistics about parental happiness and child care, new science that's shaking up the parent-advice industry, and stories from a generation of parents who are finding out that having kids isn't all they thought it would be. Why Have Kids? presents startling, new material that will change the way you think about the age-old questions of children, parenting, and happiness. 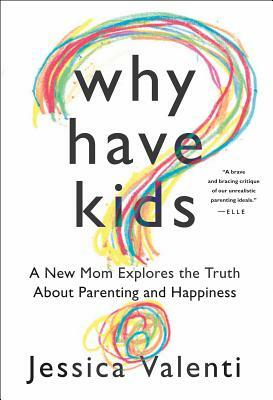 This book did make me wonder about the reasons why I had kids. It made me think about the expectations women face, about our seemingly limited options. I'm especially fascinated by woman who decide not have children. Here is where I'm supposed to say that I'd do it all over again, I'd have my 3 kids and live my life exactly the way I have. But who knows? If I knew then what I know now? Who knows. In Why Have Kids? Jessica Valenti talks about the reality of motherhood. Is it really the hardest job in the world? Is it really the most rewarding and joyful thing that a person can do? These questions may shake up your view of parenthood...and that's a good thing. Why Have Kids? is one of the most thought provoking books I've read. Nice review! Thats's a hard question to ask yourself if you could do it all over again, would you! But I love my girls to pieces so I would do it again. I'm going to have to get this book. Thanks for sharing! I figure I'll know I got it right when they really do build those small rooms off the back of their houses instead of plunking me in the nursing home. I've been talking to them about those small rooms and the nice wives they will pick out that will make it all possible since they were very, very little. They will owe us at least that after we put in all of this time and energy, lol. I'm intrigued after reading your thoughts on this book! I admit that I can't imagine my life without my kids but that doesn't change the fact that things could have been differently if I had made different choices. Weird to think about but true :) I just may have to grab this one for myself to check out. Thanks for sharing! Hi Samantha, thanks for visiting :) Exactly! There's really no way to know what life would have been like if we didn't have children. Wondering about that has led my mind to some interesting places. I hope you do read this, I'd love to know what you think of it! Sounds down to Earth and enlightening. For further reading, if you are interested in a very philosophical but not so down to Earth take on this subject I recommend David Benatar's "Better Never to Have Been: The Harm of Coming into Existence." Wow Brian, even that title sounds amazing! I've never heard of that one..I'll have to look for it. I may read this one. I think parenting is highly over rated. I asked for my tubes to be tied at 26 and was refused. I had a daugther when I was 31, now 37 and had my tubes tied, thank goodness. There is no way I would do it again, I would spend top dollar to find a doctor who would have tied my tubes. Everyone says children add to life but it is a new life which many love. I am glad I had a girl and love her and she is a good girl but life is not what I would have chose. Definitely adding this one to my TBR list, thanks, I never heard of this one. Marce, she actually brings that up in the book..how women are routinely discouraged from making the decision to not have children. I have to say that I commend your comments. I feel as if we're not allowed to say things like we have here. We're not supposed to question our decisions, we're supposed to perpetuate the myth that having children is the most magical thing that can happen to a person. I do hope you'll read this one, I think you'll enjoy it. This sounds great, and it's nice to hear about a book on motherhood that is going to ask these questions. I think it'd be a good companion read to a couple other books I read recently, How to Be a Woman by Caitlin Moran and The End of Men by Hanna Rosin. Nelle, when you get to it you'll have to pop in and let me know what you thought. I found it fascinating. I want to read this. This is a topic that drives me crazy. I'm 27, I've been married for 2.5 years, graduated from law school, and waiting for bar results. But people just want to know when I'm going to have kids! When I say, well maybe I want to wait till my life is stable or want to wait until I get a nest egg or when I actually tell the truth, that I'm not planning on having any, people go crazy on me. I can't have a conversation without having to argue/defend my decision to wait. It didn't matter that I was in law school. People told me, "oh it'll work out." Men are especially patronizing. "Oh you'll change your mind," as if it isn't possible for me to feel strongly and seriously about something like this. Rant away! It's ridiculous that women are subjected to this if you ask me. We can't do anything other than breed or what?? Ugh. And guess what people? It's none of your damn business!